Wrong. The Viola are one of those teams that may be down, but are never out. Their place in the table is misleading, and their hunger to climb the table before season’s end is likely voracious. Plus, everyone wants to be the team that steals points from the league leader on their title chase. The difference is, Fiorentina are a team who could actually do it. Despite the much heralded return of Ibra and the long-awaited potential return of Andrea Pirlo, this match will be a true test of our desire for the Scudetto. Coming off of the magnificent derby win, the team must regroup and focus in order to avoid dropping points away. As Jovan pointed out in the previous post, this could be one of our toughest fixtures before our last dance at Udinese. Okay, so first, suspensions. Cassano is suspended for his 10 minutes of fame in the derby. But Fiorentina are also missing Romanian badboy Adrian Mutu to yellow card accumulation suspension, which is likely to hurt them more. This leaves them with only one real striker up front, the solid albeit inconsistent Gilardino. Mihajlovic may also play Babacar or may save him for a sub, but with Jovetic out all season with injury, that is literally all they have up front. He will likely get lots of support from a midfield possibly made up of some combination of Vargas, Montolivo, Donadel, Cerci, Ljajic, or Santana, none of whom seem to mind scoring goals. Fiorentina’s midfield are their strength, which means Allegri will have to field a midfield that is equal to the task. This match will be won or lost in the midfield. With Gattuso probably needing to sit this one out for his hamstring injury last weekend, I am hoping that Allegri uses van Bommel, Flamini, and Seedorf, but only if he plays on the left or the center back. (Ironic that Seedorf is touted as our one true CAM, and he has singlehandedly ground our midfield to a halt in that role all season long!) I much prefer Boateng up behind the strikers, he is what we’ve been missing all along. The Fiorentina defense will need to be on their best. They have conceded an average of just more than one goal per match all year, although it could have been worse. Their talisman keeper, Sebastian Frey, has been injured most of the season, and they were very lucky to have Polish National keeper Artur Boruc as a number 2, who deputized well for Wolverine. Defensively, this will be a tough team to score against, but not the toughest. Assuming Allegri goes with Ibra and Pato up top, we could see a couple of goals. Especially if Ibra reprises his fantastic game on the initial fixture earlier this season at the San Siro. Of course, a result is also counting on our defense being the rock they have been this season, and Abate and his mystery counterpart coming up the wings to provide important crosses. Abbiati is still the most underrated keeper maybe ever, Gilardino and friends will have a tough time putting one past him. We should look for the clean sheet to play it safe. I know we usually focus these previews on tactics and formations, but I would like to leave you with some interesting story lines for this match. 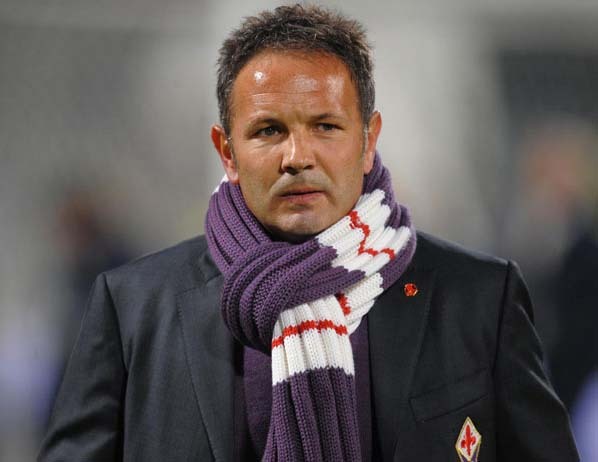 Fiorentina Coach Sinisa Mihailovic once received an 8 match ban for spitting and kicking one Adrian Mutu, who now plays for him. He is also an Interista, having played his last 2 years of club football there, and been an assistant coach for 2 years thereafter as well. A former Inter player who has offered praise for his free kick skills is one Zlatan Ibrahimovic. I think the ultimate would be if Ibra scores the winning goal on a free kick. Sunday evening will see if we can turn these dogs into whimpering puppies or if they will turn into the attack dogs they are known to be. One thing is for certain, they will not be lying down and playing dead for Milan, this will be an excellent match with two determined teams. Let’s just hope that we are the hungrier team on the day.